Workers monitor water discharge from groundwater bypass operations. TEPCO officials have admitted that groundwater bypass operations are failing to reduce tons of water from entering the crippled reactor buildings at the Fukushima Daiichi nuclear power plant. According to TEPCO, at least 400 tons of groundwater flow into reactor buildings each day where it comes into contact with extremely contaminated materials. The utility announced that its groundwater bypass operations would reduce the amount of groundwater by up to 100 tons per day and began pumping operations in May in hopes of extracting groundwater before it entered reactor buildings and redirecting it into the Pacific Ocean. At a news conference on Monday, Teruaki Kobayashi, a TEPCO official told reporters that two months after beginning pumping operations the utility has yet to see any real effect from the operation on water levels in the reactor buildings. 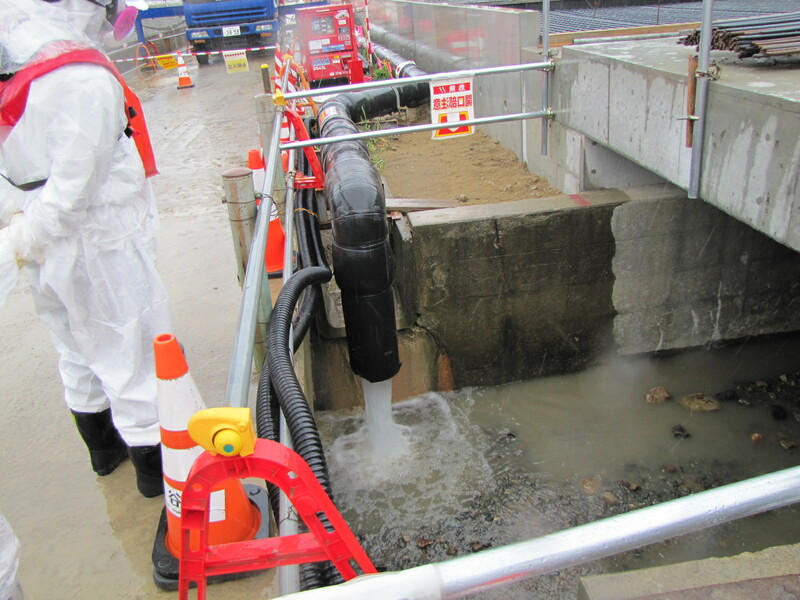 TEPCO says they don’t know when, if ever, the pumping operations will have any tangible effect on groundwater levels. In June, TEPCO was also forced to admit that it’s ‘ice wall’ operation, which was also intended to control groundwater flow, was also unsuccessful. After two months of pumping calcium chloride into the ground near the Unit 2 reactor, officials announced that they weren’t able to get the water to freeze to form the ice wall.